This little munchkin is well passed 7 months (the 25th) but we passed that mark right at the beginning of her ongoing nursing strike, when I was really not coping well, and writing about her in the mood just didn't seem fair. So consider this a 7.5 month update! If you are curious to compare, here is Scout's 7 month update. They are eerily similar in development. This little one is pretty awesome. She loves people who are familiar to her, greeting them with big smiles, lunging towards them. Love her little hugs and snuggles. She zombie crawls (similar to an army crawl) all over the house now. She's pretty fast at getting somewhere, but can also spend a great deal of time looking around and watching the traffic go by. She pops up on all fours all the time now, rocking constantly, lifting one hand, and taking a few crawling movements here and there. She, just this weekend, starting pushing herself up to a close-to-sitting position, and then falls over onto her face. Her arms just aren't quite strong enough to catch her on her way back down. And she has absolutely no sitting balance. When you put her in a sitting position, she just tips right over. She hates to bend in half; she'd rather be standing. If she wasn't so good at getting around, I'd be worried. Also this weekend, she pulled herself up to standing on a bulk package of Costco toilet paper (just like her sister!). Fluke for sure, I think it was because she could grab on to the plastic. She was super unsteady and fell quickly, but it was crazy to watch. She also likes to crawl (or whatever) over pillows and toys, so I'm sure pulling herself up is coming soon. When she is on all fours, she's been trying to get her feet under her more so that she is on her hands and feet. I have this suspicion that she is going to move quickly from crawling to standing and we are going to have a big mover soon. She loves to eat and is enjoying lots of finger foods. She eats pretty much anything that is soft or dissolvable and we can get into small pieces. Lots of banana, beans, avocado, bread, and scrambled eggs. This week she got to try some lentil chili and she loved it. She is starting to use her pincer grasp pretty well, which means a whole new world of food eating is opening up soon. She loves splashing on her belly in the bathtub. Which is good since she needs one every time she eats. She hasn't nursed in over two weeks, screaming bloody murder like I'm torturing her anytime I offer. 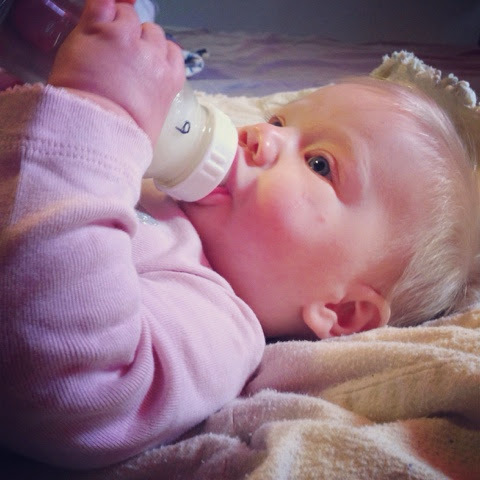 But she takes a bottle decently and gets a mix of formula and breastmilk throughout the day. So far, my supply is doing well, and she's getting at least 50% breastmilk everyday. She loves playing with toys and looking in baskets, its fun to see her start entertaining herself more. She is starting to drop her third nap and doing more and more days with just two good naps (1.5-2.5 hours). She goes to bed like clockwork at 6 pm every night, and sleeps until 6 or 630 every morning. Perk for me, since she stopped nursing, she hasn't been wanting me in the middle of the night. Occasionally, we hear wake up and jabber for a bit, but she goes back to sleep on her own without crying. She is super easy to put to down for a nap or bed. We have been trying to get in the routine of singing her songs on her way to bed, but literally we just lay her in bed and she goes to sleep. Crazy and awesome. She loves riding in the ergo right now, so I'm trying to remember that when she gets a bit fussy, usually cranky at being left alone on the floor while we are all busy moving around, to toss her in and let her hang out with us. She has two little teeth on the bottom. I think one was all the way through by the time she was 7 months and the other one has happened in the last two weeks. She's working on the top ones.